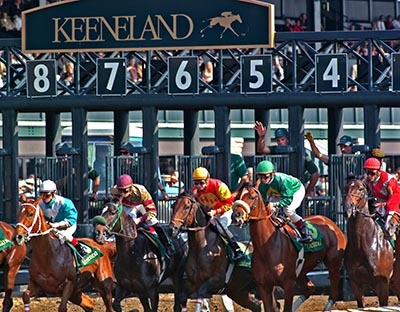 Keeneland first opened to the public on October 15, 1935 and has been a great center of Thoroughbred racing in Kentucky and the US ever since. The fall 2011 racing season at Keeneland is set to open on Friday, October 7th. Things will get off to a big start with the running of the Alcibiades Stakes, a 1 1/16 mile Polytrack race for 2-year-old fillies, with a purse of $400,000. As part of the Breeders’ Cup Challenge series, the winner of the Alcibiades will earn an instant entry for the Breeders’ Cup Juvenile Fillies. While the field for the Alcibiades isn’t set in stone yet the main contenders who are likely to start include Tu Endie Wei, Flashy Lassie and Rocket Twentyone. The likely favorite will be the two time winner at Woodbine – Tu Endie Wei. With two strong performances on the Polytrack at Woodbine she is likely to have a major advantage over other contenders who are unproven on the synthetic surface. Although she has been based in Canada Tu Endie Wei is a Kentucky-bred filly, so this race will be something of a homecoming for her. She’s already had one stretch out race at 6 ½ furlongs in the Ontario Debutante on June 25, and looks ready to tackle an even larger distance of 1 1/16 miles which is a far way to go for any Juvenile at this point in their career. Trainer Reade Baker is looking to use this race as a prep for the Breeders’ Cup Juvenile Fillies and a strong performance will have him on his way to Churchill Downs. Other likely contenders include the pair of Grade 3 winners Flashy Lassie and Rocket Twentyone. Flashy Lassie got her first big score in the Debutante at Churchill Downs back in June. Rocket Twentyone was the winner of the Arlington-Washington Lassie at one mile in September, also over Polytrack. You can keep track of the fall action at Keeneland by taking a look at the selections offered by Winning Ponies and by watching and studying replays. Keeneland has an active YouTube channel where they post all replays featuring Trackus technology. The fall 2011 meet at Keeneland will only be around for 17 days from Friday, October 7, through Saturday, October 29. Over the course of the meet there will be nine graded stakes – five of them Grade 1 and six “Win and You’re In” Breeders’ Cup challenge races. congratulation for your 75years in the service.it is a mirror of your dedication to the service of horse racing world.